• Make sure no one else is currently using the scene. Failure to do this may result in file corruption and loss of your work. 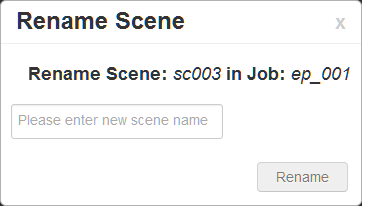 ‣ Select Scene > Rename. • Use lower case letters if the scenes may be used with a Windows workstation. • When creating a new scene or renaming a scene, the scene name cannot exceed 23 characters.